. "Expo 67". The Canadian Encyclopedia, 17 May 2017, Historica Canada. https://www.thecanadianencyclopedia.ca/en/article/expo-67. Accessed 18 April 2019. Expo 67, the "Universal and International Exhibition," was the highlight of Canada's Centennial celebrations in 1967. Senator Mark Drouin of Québec first developed the idea of a world exhibition in Montréal to serve as a focal point for Canada's celebrations of its 100th birthday. Expo 67, the "Universal and International Exhibition," was the highlight of Canada's Centennial celebrations in 1967. Senator Mark Drouin of Québec first developed the idea of a world exhibition in Montréal to serve as a focal point for Canada's celebrations of its 100th birthday. Senator Drouin and Senator Sarto Fournier, former mayor of Montréal, first presented the idea to the Bureau International des Expositions in Paris, but that body initially decided that the 1967 world exhibition should be held in Moscow. 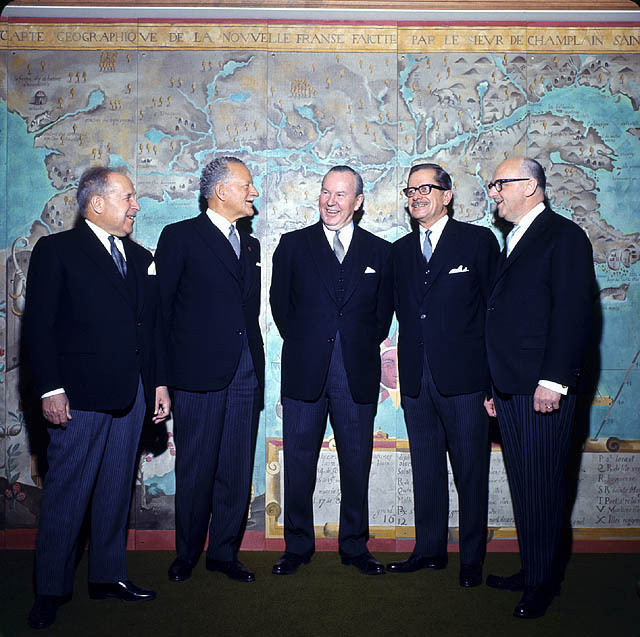 In late 1962, however, the USSR cancelled its plans and Montréal's mayor, Jean Drapeau, made a fresh presentation to the BIE and the exhibition was awarded to Canada. That Expo 67 was sanctioned by the BIE virtually assured participation by a majority of the countries of the world. What is more, the BIE designated it as an exhibition of the "first category," the first to be held in North America. The most important aspect of this "first category" classification is that the exposition must cover the full range of activities of contemporary man. United States of America Pavilion and view of the minirail at Expo 67. 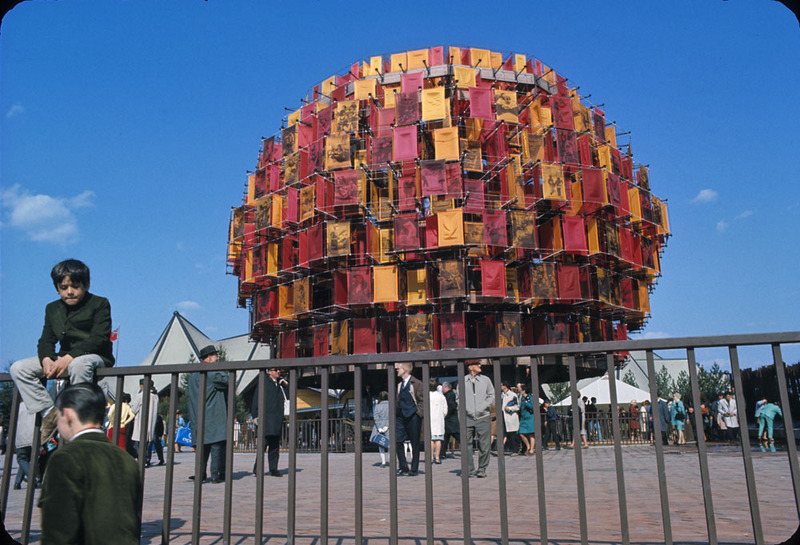 Canada Pavilion at Expo 67. Implementing legislation passed by the House of Commons in late 1962 established a crown company, the Canadian Corporation for the 1967 World Exhibition, to build and run the exposition. The exhibition was to be a three-way partnership, with 50 per cent participation by the federal government, 37.5 per cent by the Québec government and 12.5 per cent by the city of Montréal. With time pressing, the three governments called a conference of educators, literary figures and intellectuals at Montebello, Québec, to choose a central theme and evolve a philosophy for the exhibition. "Man and His World," the theme chosen at the Montebello conference, derived from the title of a book by the French author, poet and aviator Antoine de Saint-Exupéry, Terre des Hommes. On schedule in late 1963, the master plan was completed and submitted to Parliament. 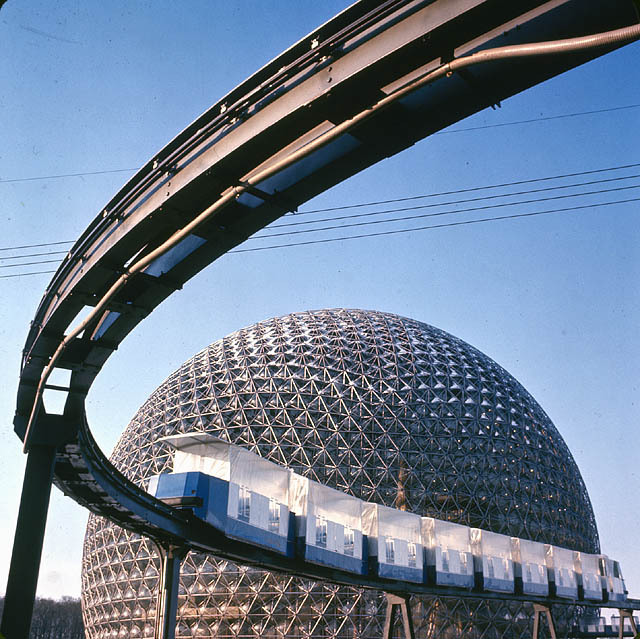 By late 1966 the corporation listed approximately $320 million as capital-incurred costs of Expo 67 and $138 million as anticipated revenue, yielding an expected deficit of $82 million. The choice of a site for the exhibition presented many difficulties, not the least of which was the shortage of time. Many proposals were studied, but it was finally decided Île Sainte-Hélène, a park in the centre of the St. Lawrence River linked to Montréal by the Jacques Cartier Bridge, would be expanded by land reclamation techniques using silt and rock dredged from the bottom of the river. In addition, a new island, Île Notre-Dame, would be created adjoining Île Sainte-Hélène and alongside the St. Lawrence Seaway. River bottom sources of landfill proved insufficient and for months parades of dump trucks bringing landfill moved to the site on a 24-hour-a-day basis, and the cost of building the site rose from the original estimate of $10 million to $40 million. Despite all the problems, the site was formally turned over to the exhibition corporation on 1 July 1964. As finally developed, it was divided into four main areas. The entrance at Cité du Havre was formerly known as Mackay Pier, a part of the port of Montréal. From the Cité du Havre, the new Concordia Bridge across the St. Lawrence led to the first exhibition area on the western section of Île Sainte-Hélène. The third area was the Île Notre-Dame. The fourth, La Ronde, at the eastern end of Île Sainte-Hélène, contained most of the amusement activities. The theme program was divided into five main groups: Man the Creator, Man the Explorer, Man the Producer, Man the Provider, and Man and the Community. These, in turn, were divided into subgroups. To implement the theme, the exhibition corporation invested almost $40 million in theme buildings strategically located around the site to serve as "points of polarization" for the theme groups. Illustrating Man the Creator was an exhibit of approximately 160 paintings borrowed from museums and individuals worldwide. Also part of this sub-theme were exhibitions of sculpture, photography and industrial design. The social sciences and humanities were grouped under Man and the Community. The nations that agreed to participate in Expo 67 either built their own pavilions or combined with other nations in regional pavilions. Among them, the Soviet Union spent approximately $15 million; Czechoslovakia, $10 million; and the United States, more than $9 million. The approaches taken by some of the world's greatest architects in designing the pavilions were varied and frequently breathtaking. Arthur Erickson's pyramidal Man in His Community was built from hexagonal frames of Douglas fir; the German pavilion, a 15-storey, multi-peaked tent of plastic, indicated how concept and materials might radically alter the design of buildings such as auditoriums; and Buckminster Fuller's geodesic dome for the US became the prototype for a new trend in construction. The interiors of the pavilions also varied greatly. Some presented prosaic displays of consumer goods and machinery while others imaginatively depicted their history and cultural traditions. Montréal architect Moshe Safdie's revolutionary Habitat '67 was a graphic demonstration that by industrializing the building process, there are better and cheaper ways to house people. Expo also witnessed the development of new approaches to viewing film. The multi-screen technique was omnipresent, transforming everyday sights and sounds into more vital images. Expo 67 also encouraged participation by private industry and by special groups. 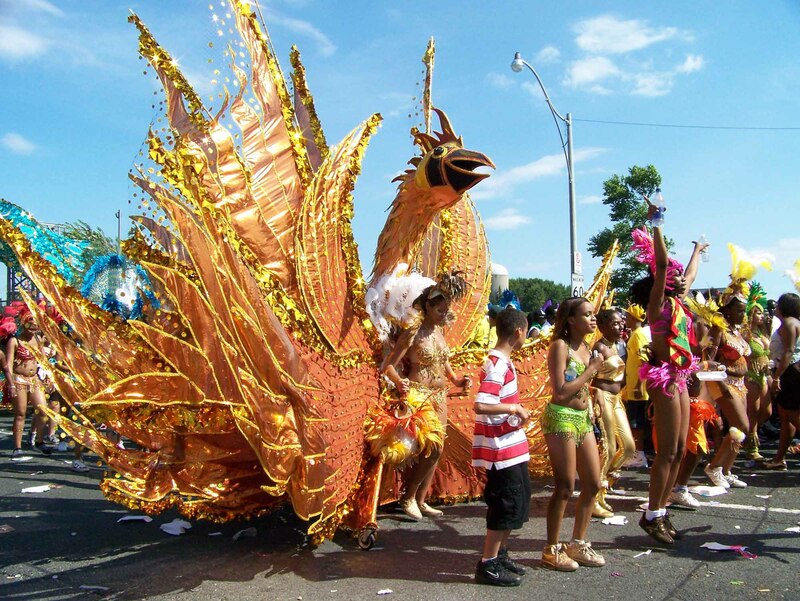 In the latter category, seven Christian churches combined to present a Christian pavilion; others included the United Nations Association, the European Economic Community, the House of Judaism, sponsored by the Canadian Jewish community, and the Youth Pavilion. 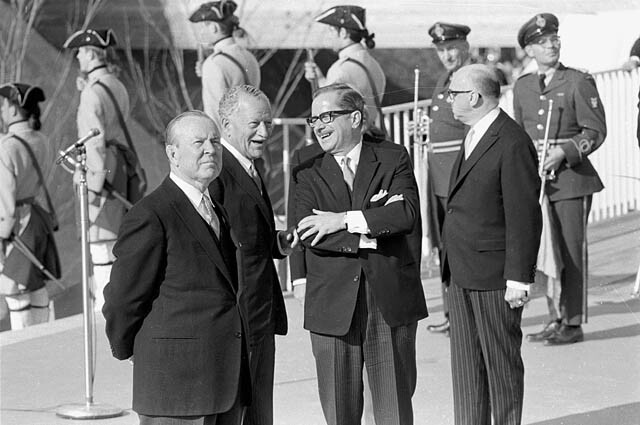 Opening day at Expo 67 with General Commissioner of Expo 67 Pierre Dupuy, Governor General of Canada Roland Michener, Prime Minister of Canada Lester B. Pearson, Premier of Quebec Daniel Johnson and Maire of Montreal Jean Drapeau. Under BIE rules, each country taking part in the exhibition may send performing artists as a part of its participation. 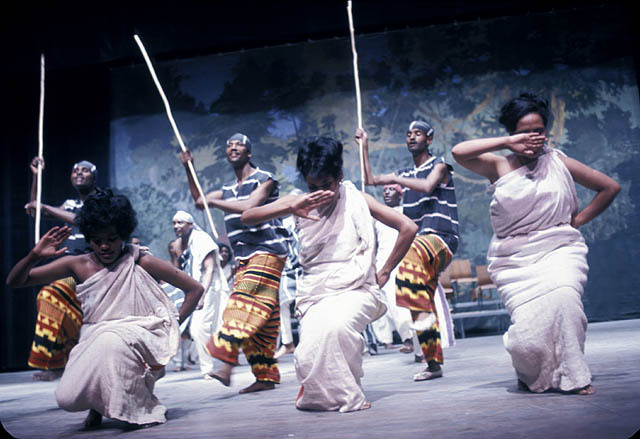 The World Arts Festival was thus able to include on its schedule such internationally known groups as La Scala Opera Company from Milan, Sir Laurence Olivier's National Theatre from Great Britain, the New York Philharmonic, the Amsterdam Concertgebouw, and classical theatre from Greece. Expo 67 and the Montréal International Film Festival combined to present a festival of more than 30 feature films during August. Sports events included an international soccer tournament, a lacrosse tournament and a European-American track meet. Spectacles such as a western rodeo and the first North American appearance of the Gendarmerie française rounded out the festivities at this, the crowning event of Canada's birthday celebration. There were some 120 governments present at Expo in 60 pavilions, and thousands of private exhibitors and sponsors participated in 53 private pavilions and through various facilities on the site. The exhibition site was planned to accommodate 26 million individual visits over a 183-day period. In fact, there were over 50 million paid admissions recorded from 28 April to 27 October, not counting over 5 million admissions by performers, the press, official visitors and employees. Expo 67 cost Canada, Québec and Montréal $283 million to put together and to run. Independent economic studies indicated that the return to federal, provincial and municipal taxpayers was almost double that amount. 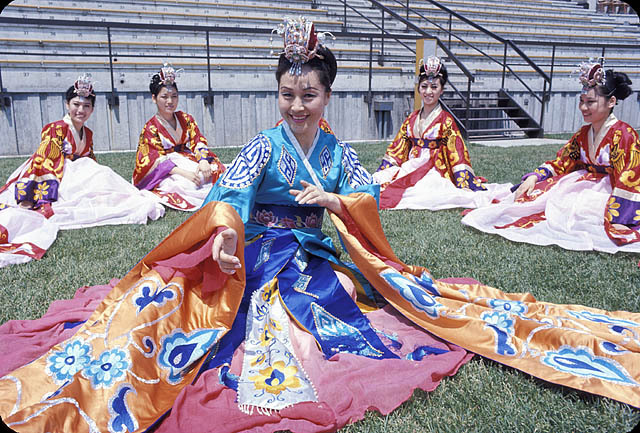 For example, the increase in tourist revenues in 1967 directly related to Expo was calculated at $480 million. « L’Expo 67 : 40 ans plus tard », Bulletin d’histoire politique, vol. 17, n° 1 (Fall 2008). Canadian Corporation for the 1967 World Exhibition, Expo 67 - official guide (Toronto: Maclean-Hunter, 1967). Pierre Dupuy, Expo 67 ou la découverte de la fierté (Montréal: Éditions de La Presse, 1972). Robert Fulford, This Was Expo (Toronto: McClelland and Stewart Limited, Illustrated Books Division, 1968). Monica Kin Gagnon and Janine Marchessault, Reimagining Cinema: Film at Expo 67 (Montréal & Kingston: McGill-Queen's University Press, 2014). Anna Jackson, Expo: International Expositions 1857-2010 (London: V&A Publishing, 2008). Yves Jasmin, La petite histoire d'Expo 67 : l'Expo 67 comme vous ne l'avez jamais vue (Montréal: Éditions Québec/Amérique, 1997). Rhona Richman Kenneally and Johanne Sloan, eds., Expo 67: Not Just a Souvenir (Toronto: University of Toronto Press, 2010). John Lownbrough, The Best Place to Be: Expo 67 and Its Time (Allen Lane, 2012). André Lortie, ed., Les années 60 : Montréal voit grand (Montréal: Centre canadien d'architecture, 2004). Jocelyne Mathieu, « Châtelaine à Expo 67 : chronique de la modernité », Cahiers des Dix, n° 63 (2009): 257-278. Expo 67Multimedia monorail tour of the colourful pavilions and grounds of Expo 67 in Montreal. From the Virtual Museum of Canada. Commentary in French with English subtitles. Foundation Expo 67Click on REVIVRE for a series of multimedia features that cover all 185 days of Expo 67. Expo '67 - First ImpressionsFirst impressions of Montréal and Expo 67 from British Pathé. The Canadian Pavilion, Expo 67A video tour of the futuristic sights and sounds of the Canadian Pavilion at Expo 67. From the National Film Board of Canada. Expo 67A 2011 article about the legacy of Montreal’s 1967 International Exposition. From the McGill Daily. Expo 67: Then and NowPhotographs and videos show how the Expo 67 site has changed since the world exposition. From Tourisme Montréal. Expo 67View scenes of Expo 67 under construction as well as clips of opening ceremonies and some of the celebrity visitors from around the world. From Radio-Canada. Expo 67Photographs of Expo 67 in the May Cutler Collection from the website for the Canadian Centre for Architecture.